Lion volunteers and members put on a Christmas dinner for the local food bank. From left to right are Harry Beckett, Jeannette Harper, David Lowery, Pat Reddick, Jane Knox, Jan Gagnon and Wayne Bent. Missing from the photo is Marty Hawkins and Bob Reddick. 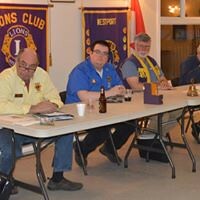 The Westport Lions Club opened their November 28th general meeting with a moment of silence in honour of Lion Kevin Northcott. Several members shared their favourite stories about Kevin. Lion René Reynen suggested that members donate socks, mittens, and scarves at our Christmas party to needy children. Everyone thought it was a great idea. The local food bank has offered to distribute them. Secretary Bob Reddick thanked the members who have sent in their activities and hours so he can record them on My LCI website. 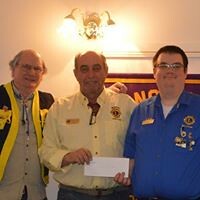 So far this Lion year the Westport Lions Club has recorded 33 activities consuming 1,848 of volunteer hours. These activities include such things as meetings, snow removal, Santa Claus parade and providing a Christmas food bank dinner. 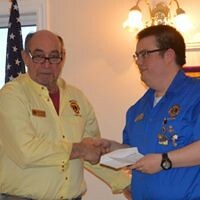 Michael Harris gave a PowerPoint presentation and led a discussion about membership, volunteers, meetings and the future direction and reorganization of the club. The officers will discuss his ideas at their next meeting and try to come to a consensus that can be ratified by the club. The club is organizing an outing for club members to see Nolan Seed from Newboro, and the Owen Sound Attack play the Kingston Frontenacs on December 14th in Kingston. It was agreed that although this year’s Santa Claus parade was short, it was well done. It was suggested that we have someone on next year’s committee to encourage organizations and businesses to enter a float. On Saturday, December 1st, a group of Lions handed out 60 Christmas cakes to seniors that were able to come to the clubhouse to pick them up. This Saturday, December 8th we will distribute the remainder of the cakes to seniors that were not able to pick them up. On Sunday, December 2, another group of Lions prepared a Christmas meal for local families who use the food bank. It is always heart warming to see Santa bring such joy to the children. 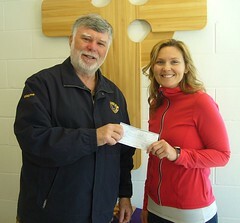 Again this year, an anonymous donor paid for all the food. A special thank you goes to the volunteers of the food bank for organizing this event, and their efforts all year to this worthy endeavour. If you have not purchased your Cash Calendar for 2019 you should do so immediately. Last year we sold out so do not be disappointed this year. Calendars are available from Lion members and from the Village Pharmacy, Westport Home Hardware, New Beginnings, Country Kitchen Diner and Westport Design Centre. For more information and calendars call, or email Jim Scala 613 – 273 – 9253, jim.scala3@gmail.com.